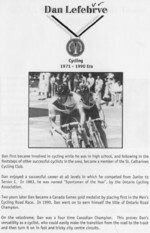 Dan first became involved in cycling while he was in high school, and following in the footsteps of other successful cyclists in the area, became a member of the St. Catharines Cycling Club. Dan enjoyed a successful career at all levels in which he competed from Junior to Senior I. In 1983, he was named "Sportsman of the Year", by the Ontario Cycling Association. Two years later Dan became a Canada Games gold medalist by placing first in the Men's Cycling Road Race. 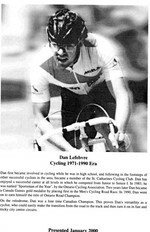 In 1990, Dan went on to earn himself the title of Ontario Road Champion. On the velodrome, Dan was a four time Canadian Champion. This proves Dan's versatility as a cyclist, who could easily make the transition from the road to the track and then turn it on in fast and tricky city centre circuits. © 2004-2016 City of Niagara Falls & Niagara Falls Public Library.